Springtime is upon us, the harvest of maple syrup is coming to an end. The fruit trees have started to bloom, another spring is here for us to enjoy. Work in the fields and in the home will bring us outside to enjoy those gifts that the great creature has given all of us to enjoy. In January at the New England Leaders’ Conference, we all met to discuss the year’s events and the chance for committees to share ideas and thoughts for future programs. The Vermont State Grange was our host and did a great job. National Master Betsy Huber was there and updated us on the activities at National Grange Headquarters. The New England Grange Building Trustees met and held elections where I, Noel Miller, is now president of the New England Grange Building. This year in the celebration of 150 years of Grange we are looking to attend more Big E parades, to support agricultural groups during the fair. We will be looking for marchers and maybe having a float for the parade. Keep your eyes open for further updates. 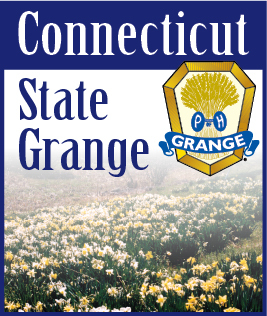 In February, the State Masters and National Grange had their conference here in Connecticut. Ekonk Community Grange #89 offered to host the conference. We stayed at the Holiday Inn Norwich and had our meals and meetings at Ekonk Community Grange Hall. It was well attended and very informative with programs from National Grange, mentoring information, leadership and communications tips that we all can use in our Granges. The meals were excellent and I wish to thank all the members of Ekonk Community Grange, Junior members, Richmond Grange, RI members and Vicki Huff of Maine for a job well done. And I wish to thank those that donated milk, donuts, cakes, cookies, ice cream, and things that I missed for their generous gifts to make Connecticut shine. The weather was great as well as the friendships and fun we have every time we meet. It was sad to hear of the death of Brother Woody Tucker of Perryville Grange in Rhode Island. Wood was High Priest Emeritus of the National Grange, and a great friend of Grangers in Connecticut. From Past Master Frank Warner to the present, Woody has touched us all with his humor, wisdom, knowledge and friendship. He will be known for his love of Grange ritual. I have heard him speak with passion on the importance of Grange ritual, and the reason for the need of the Grange in the 21st Century. If you were a doubter of Grange ritual before hearing Woody talk about ritual, you would become a believer after. I was honored to attend his wake and reflect with people there who Woody had touched. We have reported that the National Grange is publishing a new magazine “Good Day.” It is out and every Grange should subscribe. It is a magazine that is full of events, family stories, contest rules, history and other subjects that are of interest. This is a tool that could go to the Library and can promote the Grange in a better format. Check it out and I think you will agree. National Grange reported that they have found a supply of 2013 Subordinate Manuals. These are paperback, they have standard opening or the alternative opening, the Welcome Ceremony all in one manual with LARGE PRINT. This should be a must for all Community Granges to have at least 6 of the new manuals. The National Grange had had to drop its membership director due to budget cuts. Donations are being collected by the National Grange to help fund interns who will “fill the gaps” in departments like membership. The cost of an intern is $1,300.00 per month. After the National Convention I reported that the California State Grange lawsuit was coming to an end. Well, at New England Leaders’ Conference we heard that the legal bills were piling up again. At the Master’s Conference we heard that Mr. McFarland is appealing a court order again to drag out this litigation again and again. The National Grange is working with a lawyer that has filed against Mr. McFarland with an exit plan. Hopefully he will stop this suit, or face jail time. I have just received an email from the “California Guild” for a donation. The California Guild is Mr. McFarland’s creation and is not the official State Grange of California. Please do not donate to this organization. March 15 is Ag Day at the State Capitol. We will be there to meet with our legislators and the Governor and let them know the Grange is still here. It is a very interesting event with all Ag groups promoting agriculture at the State Capitol. April is Grange month so let’s get ready to really promote the Grange, open your halls, have an activity that gets the community involved. We are 150 years young so we have something in our favor so let’s tell our story so others will learn of what they are missing.